This report describes the results of the 2013/14 monitoring of fish in the Meander River, as required under the Meander Dam Water Monitoring Program (DPIWE 2007). This program describes monitoring activities required to comply with conditions endorsed on the Water Licence and Environmental Protection Notice (EPN) No. 7345/1 issued for the operation of the Meander Dam. 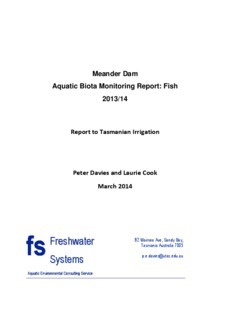 Sampling and reporting for benthic macroinvertebrates is now conducted by Tasmanian Irrigation.